Hawthorn had a dismal season in 1953. They finished last and won only 3 games. The 1950s were a bleak time for the team from Glenferrie spending much of the first half of the decade in the bottom 2 positions on the ladder. However by the end of the decade they started to taste success, reaching the finals in 1957 for the first time. 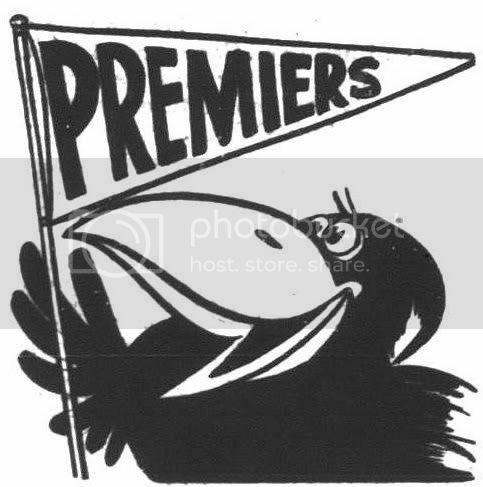 In 1961 they would finally win their first premiership. The Hawks’ coach for the 1953 season was Jack Hale. Hale made his name as a Carlton premiership player in the 1930s, and took over as coach of Hawthorn midway through the 1952 season after coaching South Melbourne in 1948 & 49. He remained at Hawthorn until 1960 when John Kennedy, took over. Kennedy often credited Hale as being the one who laid the foundations of the 61 premiership side. 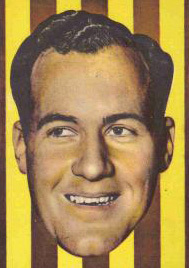 Ted Fletcher was the Hawks’ captain in 1953. A policeman from Dandenong Fletcher was a ruckman/defender who was a very good mark. In 1952 he represented Victoria and won the best & fairest award in 1953. 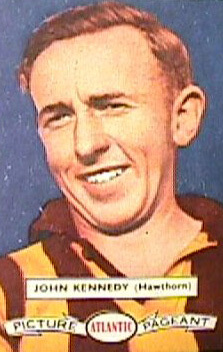 The most recognisable name on Hawthorn’s list in 1953 would be John ‘Kanga’ Kennedy. He started in 1950 and won the Hawks’ best & fairest award in his first season. He was not the most stylish football but he was extremely clever, and a fine team player who brought others into the game. He captained the club from 1955 until his retirement as a player in 1959, and won the best and fairest award four times. In 1960 he took over from Hale as the Hawks’ coach and lead them to the premiership in 1961 and a Grand Final in 1963. 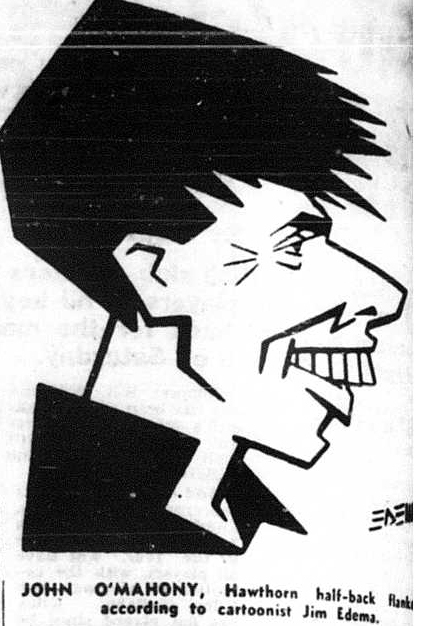 In 1964 he stood down from coaching due to work commitments but returned in 1967. He then coached Hawthorn to premierships in 1971 and 76, as well as runners up in the 1975 Grand Final. His son John Jr. went on to play in four premierships for Hawthorn in the 1980s, while his grandson Josh currently plays for the Sydney Swans. John ‘Bones’ O’Mahoney played with the Hawks from 1952 to 1960, amassing 112 games and kicking 28 goals. He was a clever centreman who both marked and kicked well. He was an unselfish footballer and creative team man. Kevin ‘Skeeter’ Coghlan was the Hawks’ biggest goal scorer in 1953. He was dumped by Collingwood with Harvey Stevens a before the start of the season and picked up by Hawthorn where he kicked 19 goals. He topped the Hawks’ goal kicking in 1954 & 55 also. He was a classy rover who was the smallest player of his era. Pat Cash Sr. played as a forward for the Hawks. He only played 8 games in 1953 due to injury, kicking 9 goals, but he did top the Hawks’ goalkicking list in 1951 with 26. He is the father of 1987 Wimbledon tennis champion Pat Cash Jr.